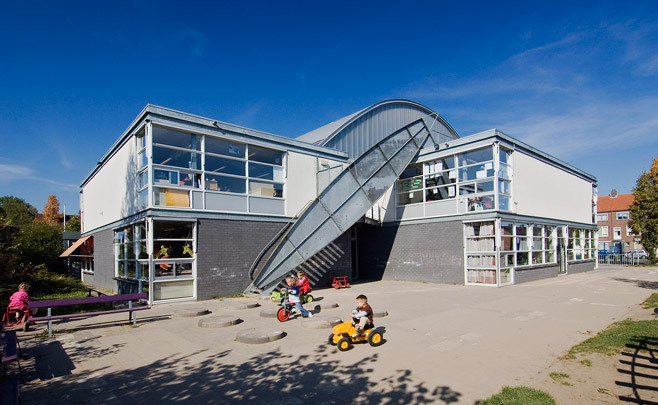 This primary school is the cornerstone of a larger, as yet undeveloped site. Its eight classes are arranged in pairs in two volumes set in a L-shape. A third, taller element contains the remaining facilities. Together these three volumes enfold a central hall with large stairs laid out like an amphitheatre where all activities converge. The central portion is covered with a pair of curved roof planes; large areas of glass admit abundant daylight into the hall. The shape of roof, the details and the constructivist stair are arguably preliminary studies for two of Hertzberger's larger-scale projects, the Chassé Theatre and the library in Breda.